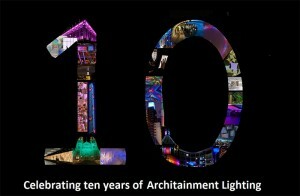 This year marks a special milestone for lighting solutions provider Architainment Lighting, as the company celebrates its tenth birthday and a decade lighting some of the UK’s most iconic structures and spaces. In the last ten years Architainment Lighting has been integral in architectural, retail and hospitality projects such as the London Eye, Selfridges, Harrods, One Hyde Park, Great Ormond Street Hospital, County Hall and most recently, a string of European retail stores for British fashion house, Burberry. The lighting solutions provider was also involved with three of the winning projects at this year’s Lighting Design Awards such as Burlington Arcade, Harry Potter World, BMW Paris, and Hedonism Wines, which was highly commended. As part of its celebrations, Architainment will be involved in a year-long fundraising effort for its cancer support charity, Maggie’s Centre. Throughout the years the lighting specialist has raised thousands of pounds for Maggie’s and this year is set to be a big year as it takes on a 60km trek across the South Downs, a 100km walk along the Thames path and a 20 mile night hike across London. A Maggie’s Centre is a place to turn to for help with any of the problems, small or large, associated with cancer. Under one roof someone can receive information, benefits advice, psychological support both individually and in groups, courses and stress reducing strategies with no appointment or referral required and all free of charge. Architainment continues to support Maggie’s not only due to the incredible work it does, but also due to its strong associations with the architectural and lighting industries. Lighting is an integral part of the night hike in particular, giving hikers an opportunity to see London illuminated at night, including Architainment projects such as County Hall and the London Eye. Participants are also encouraged to write messages for loved ones on paper bags, which are then illuminated for other walkers to read throughout the route. Commenting on this milestone, managing director Nic Tolkien said: "Reaching our tenth birthday is an incredible achievement, and looking back on the diverse range of lighting projects we have worked on, and the industry relationships we have formed as a result, fills me with enormous pride. It seems only right that we celebrate this milestone by giving back to Maggie’s, a charity that has meant a lot to the company for a long time now." As with previous years, Architainment will be tackling these challenges under the name ‘Team Easily LED’ and any donations you can give, large or small, would be greatly appreciated.